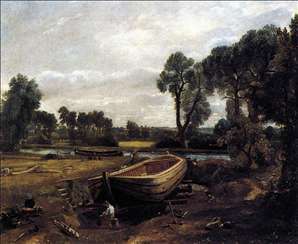 English painter, ranked with Turner as one of the greatest British landscape artists. 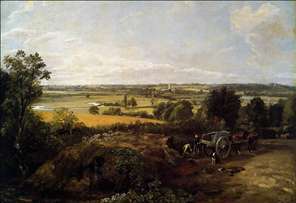 Although he showed an early talent for art and began painting his native Suffolk scenery before he left school, his great originality matured slowly. He committed himself to a career as an artist only in 1799, when he joined the Royal Academy Schools, and it was not until 1829 that he was grudgingly made a full Academician, elected by a majority of only one vote. In 1816 he became financially secure on the death of his father and married Maria Bicknell after a seven-year courtship and in the face of strong opposition from her family. 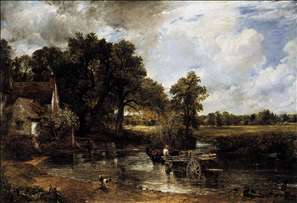 During the 1820s he began to win recognition: The Hay Wain (National Gallery, London, 1821) won a gold medal at the Paris Salon of 1824 and Constable was admired by Delacroix and Bonington among others. His wife died in 1828, however, and the remaining years of his life were clouded by despondency. 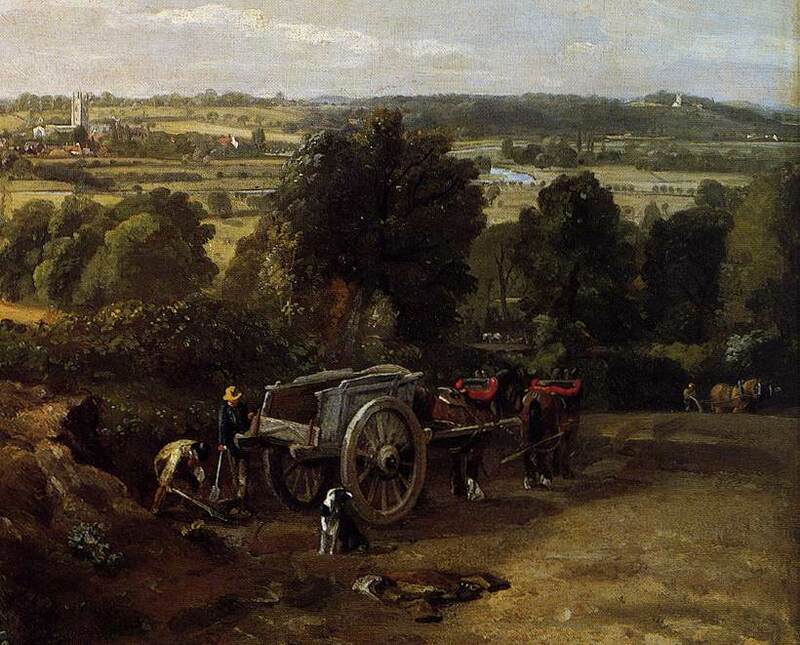 After spending some years working in the Picturesque tradition of landscape and the manner of Gainsborough. 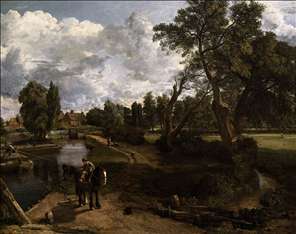 Constable developed his own original treatment from the attempt to render scenery more directly and realistically, carrying on but modifying in an individual way the tradition inherited from Ruisdael and the Dutch 17th-century landscape painters. 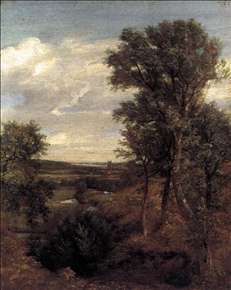 Just as his contemporary William Wordsworth rejected what he called the poetic diction of his predecessors, so Constable turned away from the pictorial conventions of 18th-century landscape painters, who, he said, were always running after pictures and seeking the truth at second hand . 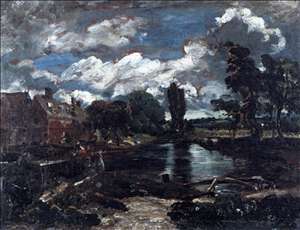 Constable thought that No two days are alike, nor even two hours; neither were there ever two leaves of a tree alike since the creation of the world , and in a way that was then new he represented in paint the atmospheric effects of changing light in the open air, the movement of clouds across the sky, and his excited delight at these phenomena, stemming from a profound love of the country: The sound of water escaping from mill dams, willows, old rotten planks, slimy posts and brickwork. I love such things. These scenes made me a painter. 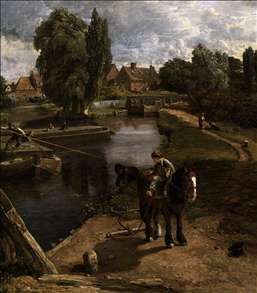 He never went abroad, and his finest works are of the places he knew and loved best, particularly Suffolk and Hampstead, where he lived from 1821. To render the shifting flicker of light and weather he abandoned fine traditional finish, catching the sunlight in blobs of pure white or yellow, and the drama of storms with a rapid brush. 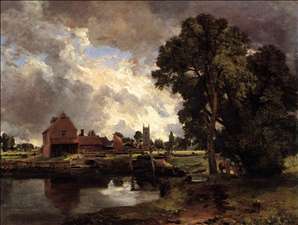 In England Constable had no real successor and the many imitators (who included his son Lionel, 1825-87) turned rather to the formal compositions than to the more direct sketches. 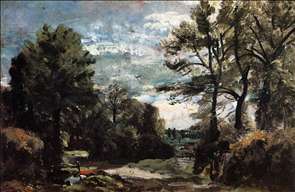 In France, however, he was a major influence on Romantic painters such as Delacroix, on the members of the Barbizon School, and ultimately on the Impressionists. See more details about "Boat-Building on the Stour"
See more details about "Dedham Vale"
See more details about "Dedham Lock and Mill"
See more details about "Flatford Mill"
See more details about "The Stour-Valley with the Church of Dedham"
See more details about "The Stour-Valley with the Church of Dedham "
See more details about "A Lane near Flatford"
See more details about "Flatford Mill "
See more details about "Flatford Mill from a Lock on the Stour"
See more details about "The Hay-Wain"